Sitting down in the massive IMAX theatre in Darling Harbour you could feel that the atmosphere was heavy with excited Batman fans awaiting The Dark Knight. They were not to be be disappointed with the latest instalment in the Batman franchise. Dark Knight is the first film to use cameras made for IMAX (a total of 20 minutes throughout the film) and therefore the result in phenomenal. It is claimed the the transition from full screen to the more traditional "letterbox" format is seamless and the expectations from the crowd were met. The Dark Knight explodes onto the full IMAX screen for the first six minutes and the action continues throughout the film. The action is fast paced and at times a little unrealistic which is perfect for this type of movie. Batman's toys are more exciting and fast than before. As each new weapon is revealed you are leaning forward smiling excited by the possibilities and you will not be disappointed. Nolan has created a gritty Gotham city which is enhanced through the colour used on IMAX screens. He has emphasised this dark city through amazing costumes with brief flashes of colour, strong make-up (in particular The Joker and Two Face) and bright explosions. Dark Knight is not only physically dark but it explores the dark side of many characters. Batman is starting to feel the burden of being a "hero" and Nolan through script and direction has allowed the audience to see how vulnerable Batman has become. The acting in the new Batman films is one of the key reasons they have been a success. 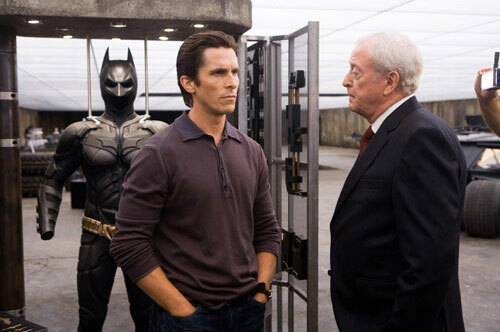 Bale, Caine, Oldman and Freeman reprise their roles in Dark Knight and have all added extra depth to their roles, in particular Freeman as Lucius Fox who reveals his morality. Eckhart is brilliant as Dent/Two Face as he falls from moral real life hero to hate filled villain. He is suitable in the role and his scenes with Bale show a struggle to be the hero. Maggie Gyllenhaal is slightly wasted in the role as Dent's main squeeze and Wayne's ex, Rachel Dawes. The character is strong but Gyllenhaal, who is an accomplished actress could have extended herself more and at times just seems to be eye candy in her designer dresses. However there is no denying the star of the film is Heath Ledger who has stolen the movie with his amazing performance that is possibly the best Joker performance to date. Ledger chills the viewer with his steely gaze and exaggerated facial expressions (the constant licking will make some squirm) and gestures. The audience is treated to a Joker that is menacing, as seen in the pencil trick early in the movie. 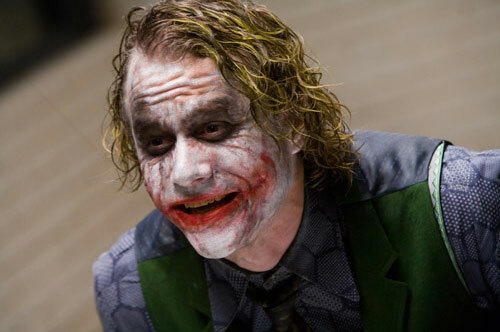 The best thing about Ledger's performance is he has found a balance between comedian, madman and dark revolutionary. At times the audience is sympathetic to his cause and I found myself agreeing with some of the Joker's points. 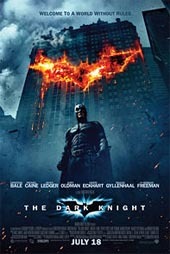 Batman is a fascinating movie that has many twists and turns to keep you interested to the end. Once again Nolan and team have created a movie that adds to Batman's story.